Female Terrapin 7086 — Why Is This Girl Smiling? 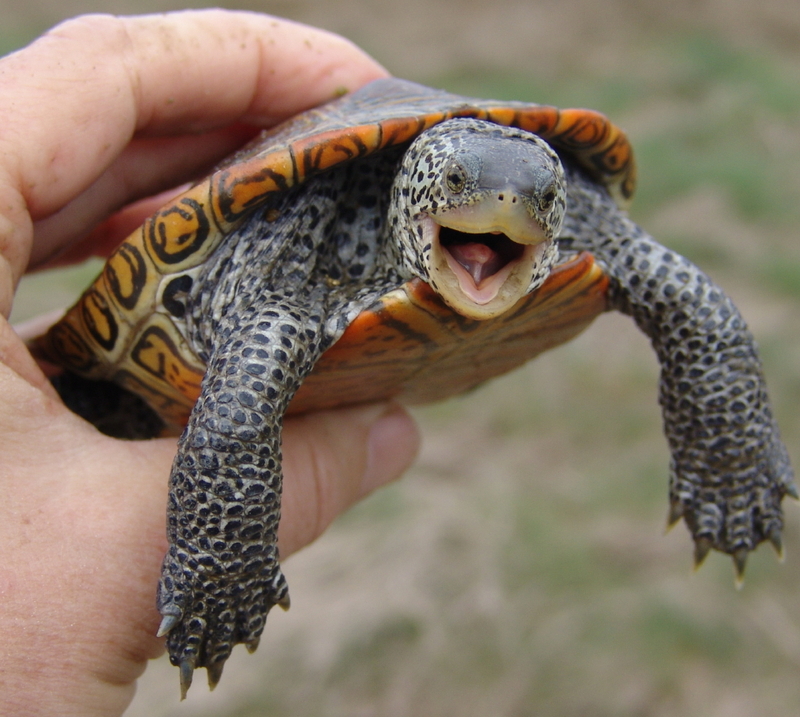 Yes, SPRINGTIME is finally here for the resident diamondback terrapins of Outer Cape Cod. On Tuesday, Turtle Journal’s Sue Wieber Nourse ventured to the Fresh Brook Run in South Wellfleet wedged between Lieutenant Island to the north and Mass Audubon’s Wellfleet Bay Wildlife Sanctuary to the south. Temperatures finally had risen from the mid 40s to the low 60s with the threat of spring thunderstorms. As Sue waded into the still chilly waters, she was greeted by pairs of smiling terrapins who were much too occupied with each other to realize a turtle researcher had approached with a large collection net. Male Terrapin 9867 — Why is This Boy Smiling? To slightly amend Alfred Lord Tennyson’s oft-quoted sentiment, “In the Spring a young turtle’s fancy turns to thoughts of love.” And turtle fancies were turned in a big way on Tuesday afternoon in Fresh Brook Run. Sue’s first capture was an unmarked mature female terrapin (now #7086) who had been cavorting with previously marked male terrapin #9867, a 10-year-old friend whom we had first seen in the Run in July 2007. Marking a great start to the new research season, Sue captured four pairs of mature diamondback terrapins in the low tide drained Run. 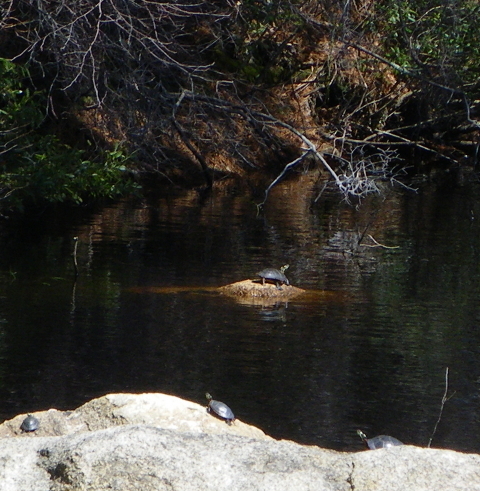 Of the four females, one was a recapture: terrapin #9268, a 14-year-old female whom we had first netted in May 2009. The others were first timers who had managed to escape our researchers for the last decade. Of the four males, we had previously seen three in the Run, and one was a first time capture. 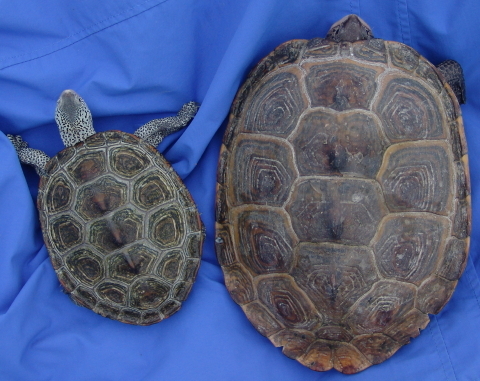 The adorable couple imaged above clearly illustrate “gender dimorphism” in diamondback terrapins. That’s a fancy way of saying that females are bigger than males, a lot bigger. In maturity, females are four times the mass and twice the length of males. Besides overall body size (dimorphism), we say there are three ways to distinguish males from females. Male terrapin 9083 demonstrates these characteristics. I ask that anyone too sensitive to hear unexpurgated truths skip to the video below. 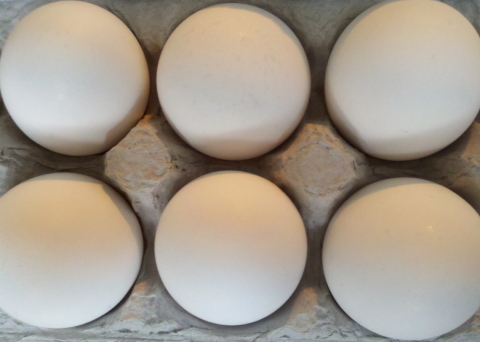 First, females must have a robust shape to accommodate eggs equal to more than 10% of their body mass. So, we say that females have depth and males are shallow. Secondly, females have distinctly larger heads, while male crania are very small, indeed. There is some casual talk about whether this cranial difference relates to the challenging role females play, or whether females are just smarter than males. Some say females need more brainpower to negotiate their way over long distances back to their natal birth site, to confront upland predators along the way, and to locate, shape and disguise viable nests. Males, on the other hand, have a simpler life; they forage, they bask, they mate. 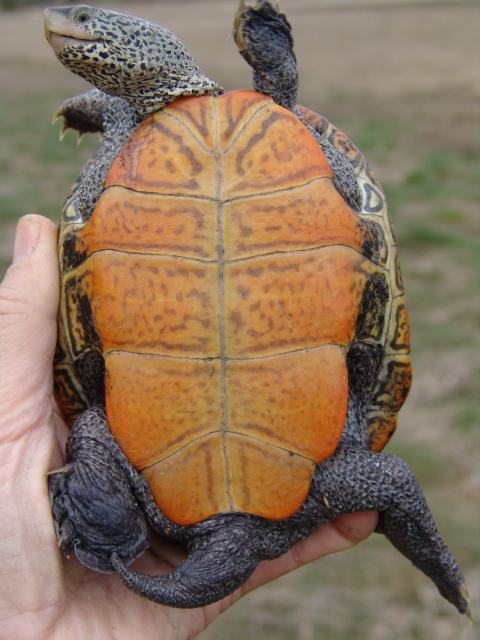 Finally, female terrapins have very small and thin tails that they tuck in closely to their bodies. 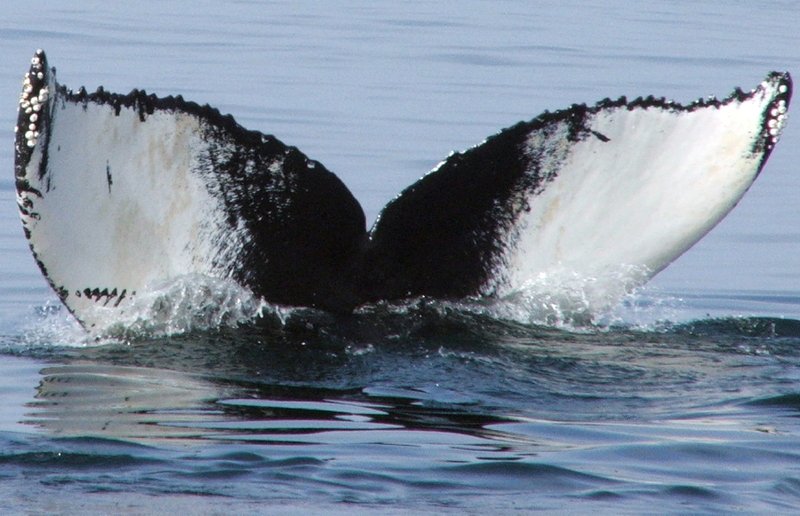 Males, on the other hand, have large, thick tails that are always prominently displayed. Some less scientific individuals might be tempted to say that males simply have excessive libidos, but you won’t hear that from us. After the brief interlude with Sue, in which they were examined, measured, weighed and marked, these terrapins were released back into the Fresh Brook Run as it rapidly flooded with the incoming tide. Perhaps it is only the eccentric turtler and inveterate poet in me, but I detect a certain skip in their step as these turtles waddle back into the tidal flats of South Wellfleet to resume what comes naturally to diamondback terrapins in springtime. Sue Wieber Nourse emailed this snapshot of the first active Cape Cod diamondback terrapin of 2011 that she captured this afternoon in the Run. The Run is the inlet between Lieutenant Island on the north and the Wellfleet Bay Wildlife Sanctuary on the south. 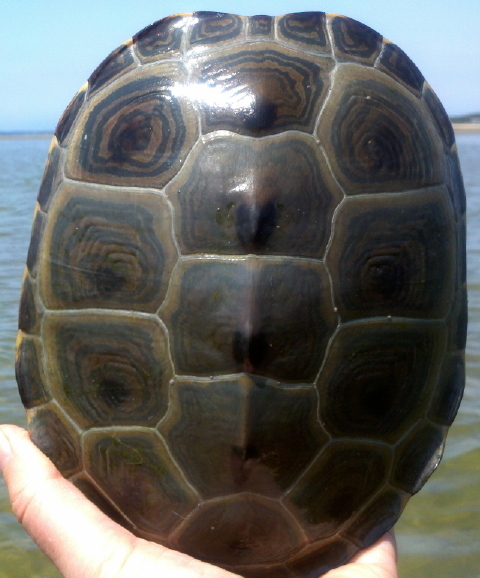 This female terrapin, which Sue captured with a long poled net while wading in the receding tide, was unmarked and therefore had not been previously seen in our 32 year longitudinal study of diamondback terrapins in Wellfleet Bay on Outer Cape Cod. begins the sacred words of every dogs’ patron poet Robert Frost. 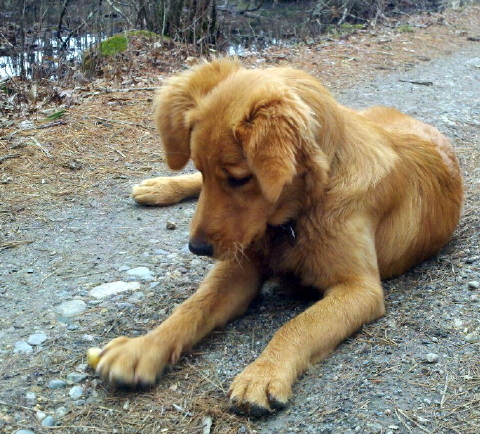 And I, Rufus Retriever, approaching the end of my six months of playful puppyhood, must choose my path. There’s the much trodden way of four-legged lives clipped to a too short leash, sniffing smells that each in turn shares with the other. Nothing new as each sun rises and each sun sets with the east still east and the west still west. Not for me this flat paved road from yesterday to tomorrow. Wake-up came early on Easter morn as I savored my last virtual romp through the cabbage patch in pursuit of the Giant White Rabbit. Though I never caught clear glimpse of his presence that I had only sensed in pre-dawn shadows, he must have been as white as the eggs he left for us to decorate on Easter Eve. Truth be told, I was surprised to learn that rabbits laid eggs, but as a budding scientist, I yearn for these surprise discoveries. 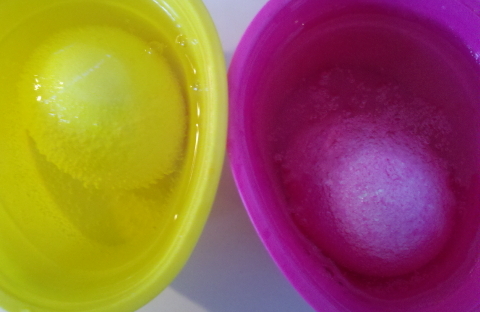 It was fun to watch preparations as cold water, tablets and vinegar were combined with white rabbit eggs to produce a festival of color and design. Even though one egg looked suspiciously like turtle, I guess they represent some sort of celebration in honor of the future hatching of baby white rabbits. Again, there’s a lot I still don’t understand, such as why we placed the perfect white rabbit eggs in boiling water; although I suppose it could have been for rapid incubation. 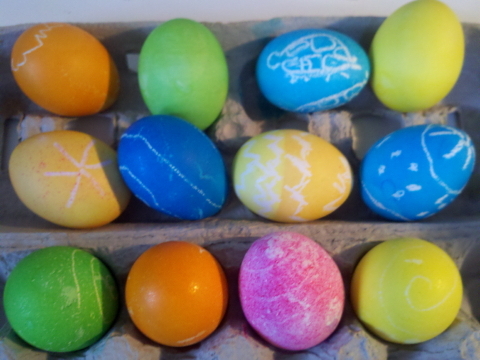 And then why we decorated each of the eggs individually; although I guess even baby rabbits want to be unique. 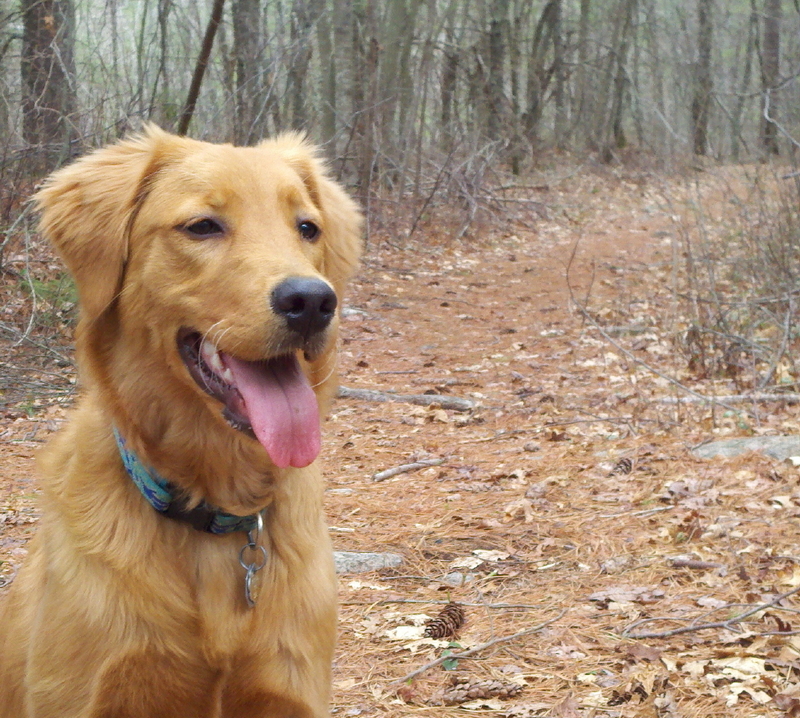 With Easter Eve as prologue, and the morning yawns behind me, I dashed into the woods in sure hope that Frost would guide me to the road less traveled. I will confess that my thoughts wandered a bit as I spyed the size of my paws and wondered whether I would ever stop growing. Would I gain the stature of the Giant White Rabbit? 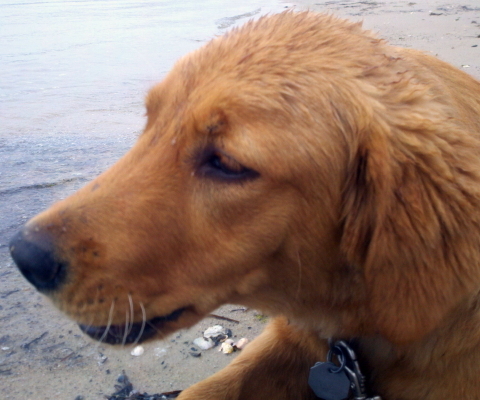 But those were transient thoughts, and I focused on my chosen path as the singular canine naturalist. Where would I find today’s discovery? 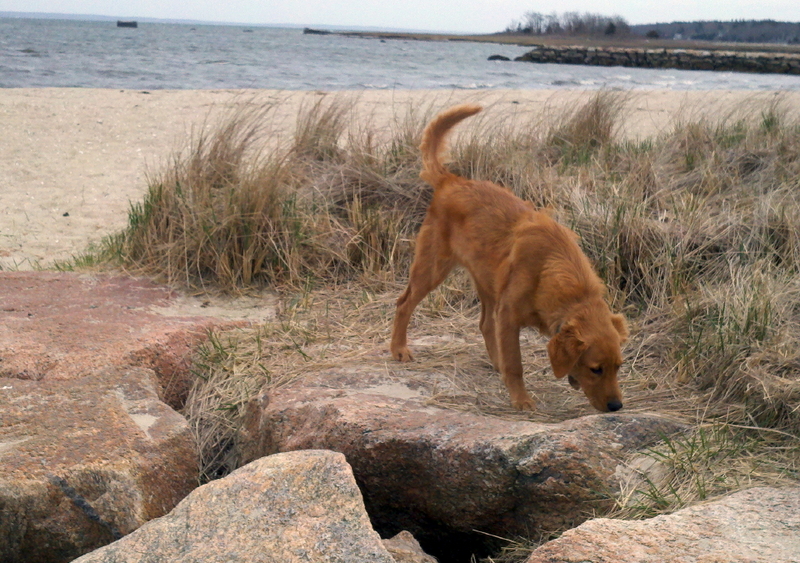 I scrambled along the rock jetties of Silvershell Beach and sniffed the abutting salt marshes. 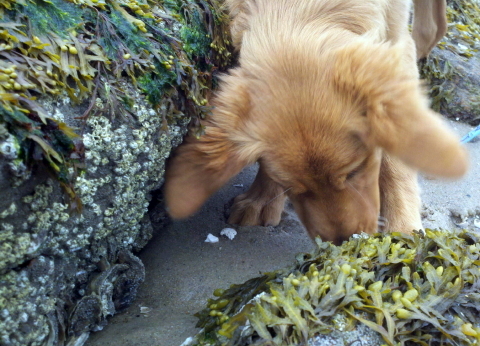 While the smells were delightful, and I detected a faint sign that my neighbor golden retriever Harry had stopped by the beach last night, the weather was still a bit chilly for estuary critters to be on the march. Still, I liked the tasty rockweed (Fucus sp.) and bursting the little air sacs proved a cool experiment. With nothing exciting at the beach, I galloped over to the bog wetlands and immediately encountered a female spotted turtle that was basking along the edge of an abandoned cranberry bog channel. I alerted my research assistant (and minder) Becky Nourse, and we carefully examined the turtle to extract lots of scientific data. Unfortunately, they have not yet entrusted me with a smart phone, so I had to permit my assistant to document the find. Yes, we admit it. We’re tired of a long, lingering cold spring and a too late start to the field research season. 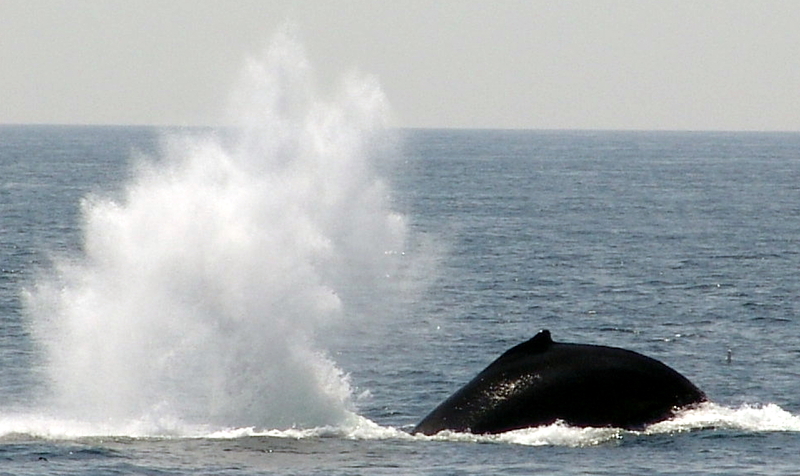 So, we’re fast-forwarding to summer with a virtual whale watch in Stellwagen Bank off Cape Cod. Beyond the unbridled pleasure of seeing these great mammals up close and personal, professional naturalists on certified whale watch vessels provide observational data and photographic documentation of whales that yield information on population trends, as well as health of individual animals and general behavioral characteristics. 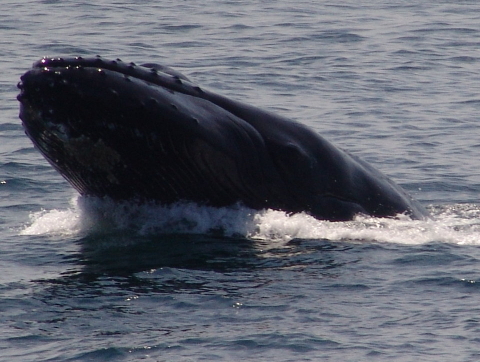 At least once a year, Turtle Journal heads out on a whale watch boat from either Plymouth Harbor or Provincetown to visit Stellwagen Bank and to savor the experience of cruising with these giant animals. We also gather documentary material on humpback, finback and minke whales for our educational programs, as well as observations of other marine megafauna such as ocean sunfish. There is nothing so majestic as a group of humpback whales coordinating a massive ”bubble net” feeding, and afterwards blowing steam for a deep dive to begin the process all over again. The Turtle Journal team visited nearby bog wetlands this morning in hopes of finding their first snake of the season. Last night howled with storms that pelted the South Coast with torrential downpours, yet temperatures remained mild in the mid-50s. The early morning high tide, augmented by a fierce southwesterly gale, flooded banks of Sippican Harbor in Buzzards Bay. As the sun rose, though, the day moderated and glistened in bright sunshine. Perhaps today would mark our first springtime encounter with the slithering reptiles. We waltzed along bog channels to check for basking spotted turtles. Alas, none were to be found. 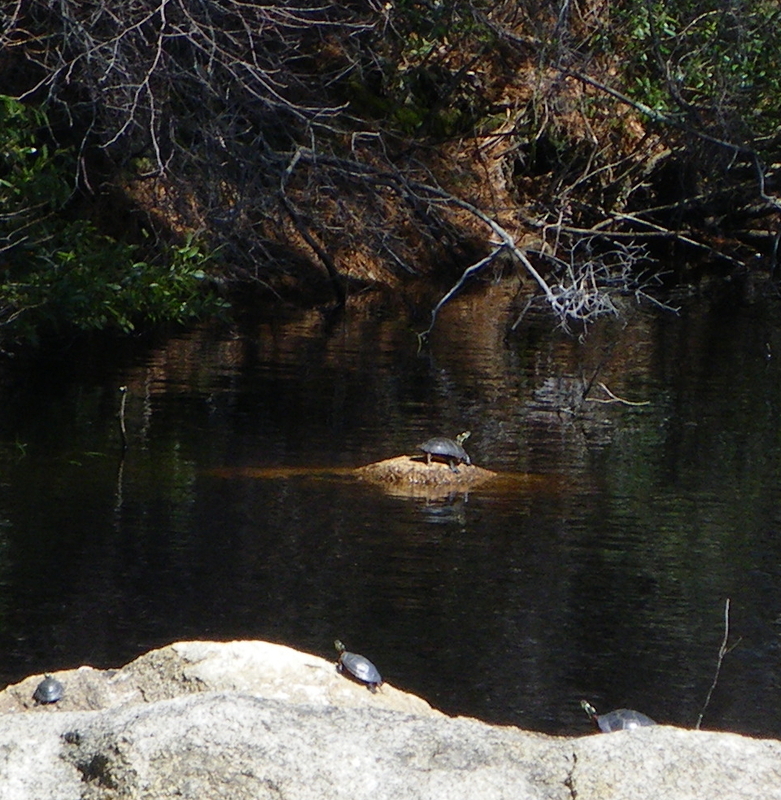 At the reservoir, though, painted turtles staked out basking rocks as they increased their internal body temperatures to begin foraging and then mating. 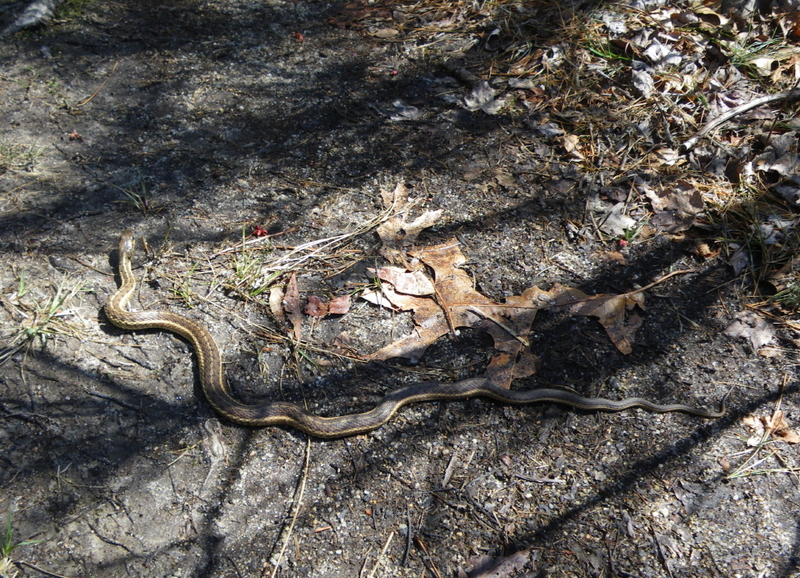 Even though Don had been expecting to find the first snake of the season basking along the bog path today, he managed to step right over this good sized garter snake that had completely blended into the pathway as if it were a protruding tree root. 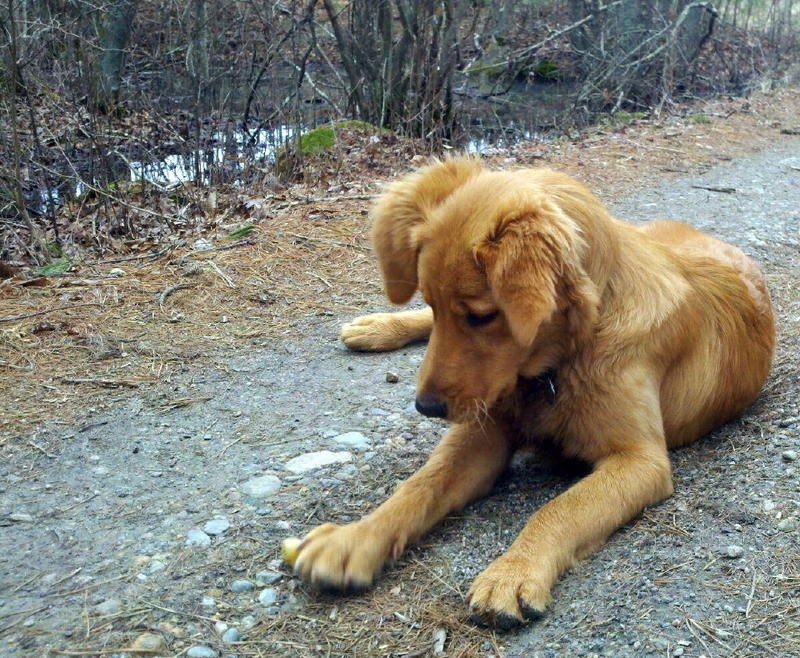 Luckily, Sue spotted the snake that Don had nearly tripped over. 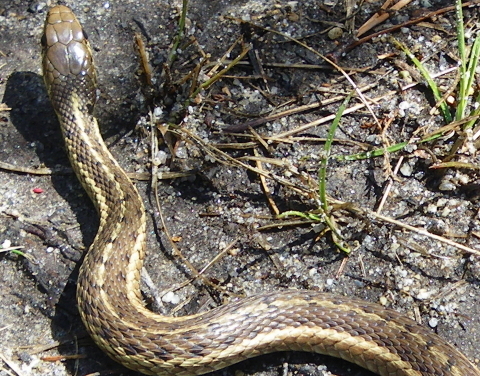 Common garter snakes are widely distributed throughout North America. Since garter snakes are the Massachusetts’ state reptile, it seemed fitting to be the first snake that we encountered this spring season. Garter snakes are not the only snakes found in the wetlands of the abandoned Goldwitz cranberry bog. One of the first slithering reptiles we discovered in this locale was the northern water snake, a large, “non-venomous” snake native to North America. 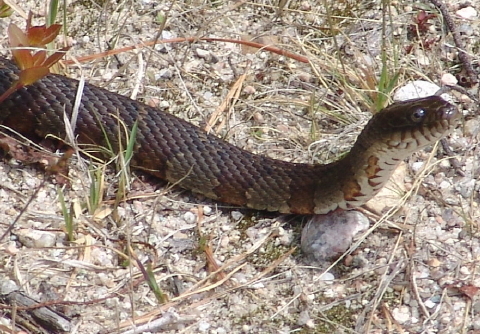 They are darkly colored and interestingly patterned and are sometimes mistaken for copperheads. These snakes aggressively defend themselves by repeatedly striking and biting when cornered, and their saliva contains a mild anti-coagulant. Since Don is on a strong anti-coagulant, he has no desire to test the limits of this “non-venomous” additive. 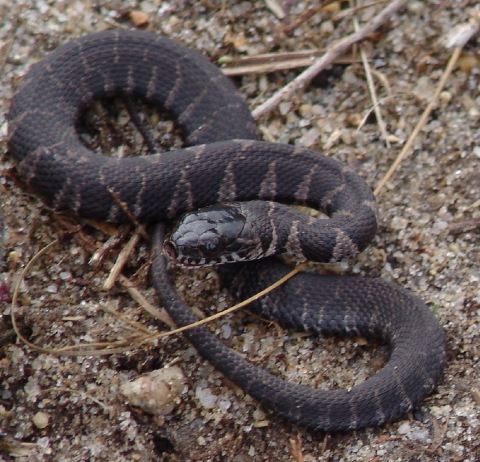 The Turtle Journal team ran into a juvenile northern water snake at the bog a while back that proved everything that books say about their aggressive behavior. We have never seen a more combative critter in our field studies. Don gently prodded the vicinity of this juvenile snake to assess it reaction. And, boy, did it react! After the first few strikes at the pole end of our ten foot long net, we were really glad that the pole was ten feet long. Despite that energetic encounter, snakes remain one of our favorite Turtle Journal creatures. They are extremely beneficial to the environment and the eco-system, and they’re just plain gorgeous … once you get beyond the slithering cold-blooded reptile thing (smile). 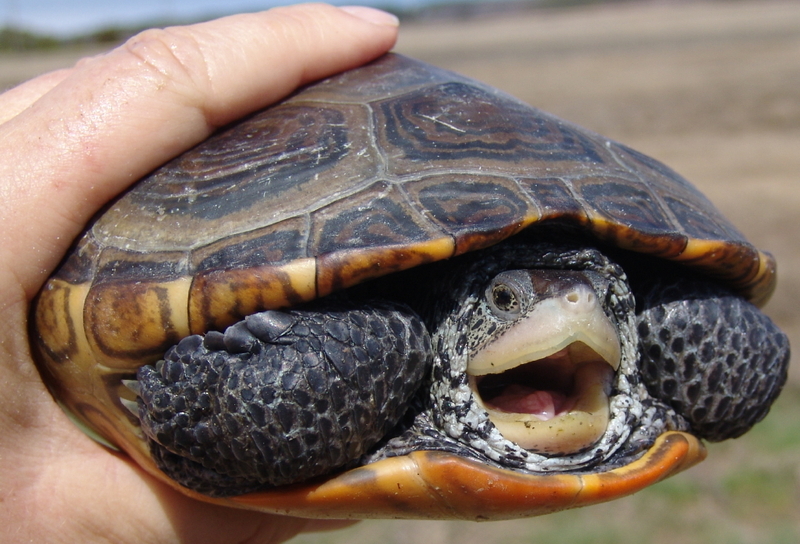 You are currently browsing the Turtle Journal blog archives for April, 2011.